The wreckage of one of the buses after the accident. 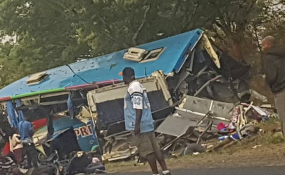 We extend sincere condolences to families that lost their loved ones in Wednesday's horror crash that claimed 46 lives when Smart Express and Bolt Cutter buses side-swiped along the Mutare-Harare Highway near Rusape. Government has since declared the accident a national disaster. We have said it before and will say it again: Some of our road users have become death merchants. They killed yesterday. They are killing today and they shall kill tomorrow unless we make deliberate efforts to stop the carnage today -- all of us. If our national goal is to reduce road carnage to 50 percent by 2020, it means there should be a paradigm shift in how motorists behave on the roads, considering that human error is blamed for the majority of the accidents. The Traffic Safety Council of Zimbabwe (TSCZ) has since said that driver errors are clearly the major cause of road traffic crashes. If human error is behind the carnage on our roads, it is prudent to ask where law enforcement is? If the law is not being enforced, we have to ask why, and whose responsibility it is to ensure that traffic laws are followed to the letter by all motorists. If the laws are archaic, it means the current Parliament should be seized with the matter to ensure that the traffic jungle is tamed. Many roads require refurbishment, but not the Mutare-Harare Highway, since it was resurfaced and marked. Thus, we cannot blame the accident on potholes. Initial reports clearly show that this tragedy was a result of negligence and human error on the part of one of the bus drivers. We should also ask ourselves how much these accidents drain from Treasury and other well-wishers. Former Transport and Infrastructural Development Minister Joram Gumbo said in July this year that the country was losing about $406 million a year due to traffic accidents, which amounted to three percent of the national Gross Domestic Product. As we search for answers, we should also realise that we are in this together. We have, by commission and/or omission, nurtured the traffic jungle, and we have to undo the mess inclusively. Traffic regulations should be enforced and the long arm of the law should ensure that drivers who break the law are brought to book. We do not understand why we have never seen a breathalyser on our roads when such equipment is standard issue to traffic police the world over. As drivers are reoriented, the multi-sectoral approach suggested by the TSCZ spokesperson Mr Tatenda Chinoda, should also be implemented, where he suggested educating drivers to eliminate accidents. "The drivers who would have violated traffic rules deserve to be arrested, but education must come first. Drivers are only trained to get a licence for driving safely, but there are lot of things which drivers have to be taught to avert the increase in road traffic accidents," said Mr Chinoda. It is also imperative to know what the different stakeholders should do in the event of such a horrendous accident. We don't have to reinvent the wheel. In this age of news-on-demand, we have seen how some nationalities are always in a state of preparedness: the police, hospitals, fire brigade, ambulances and volunteers, while the media is on stand-by to inform the nation. While we all have these, the major issue is whether they are capacitated to do their work. When push comes to shove, are they able to deliver? For example, how many critical patients were taken to other hospitals through other means, other than ambulances and/or private cars? Who were the first responders, and have the media been informing the nation on a regular basis, because this is a national disaster? When there is only one national broadcaster, is it wise that they screen a fortnight-old soccer match instead of giving updates of events on the ground in Rusape? This goes for all media. A national disaster cannot be treated as business as usual.